Every comic is a gateway to a world of wonder. Top talent collaborators provide intense imagery that can dazzle the mind, bringing readers to bizarre landscapes or welcoming them into a comfortable reimagining of years gone by. Be they painted, penciled, detailed, or minimalist, a cover can set the tone for an entire story. At Midtown Comics, we are fascinated by the different art styles that grace the books on our illustrious shelves, so we want to share the best of the best with you! Here’s a few of our favorite covers for this upcoming week, and a bunch of extra mentions that we couldn’t contain our excitement for! One of the most important parts of being able to adeptly draw Aquaman is being able to draw dynamic water. 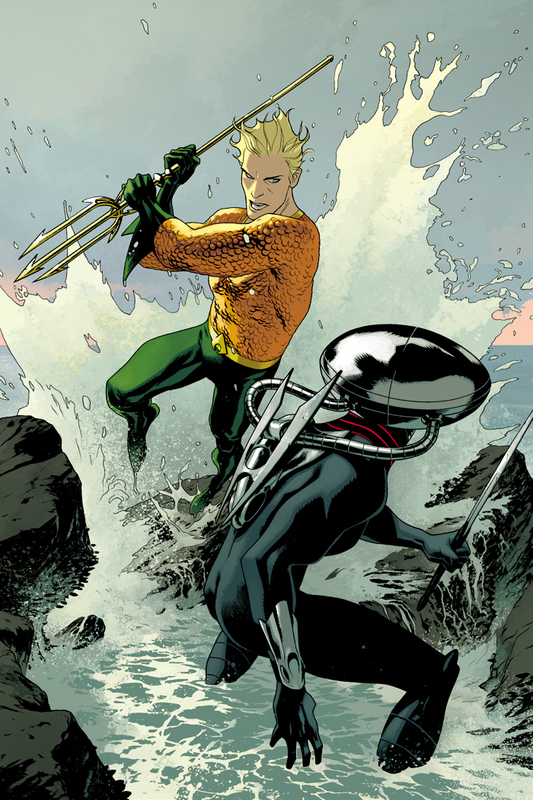 Joshua Middleton shows that he is more than capable, as his cover to issue 3 showcases Arthur Curry leaping out of a crashing wave, preparing a crushing blow to his adversary. Black Manta stumbles back, bracing himself for the impact of his foe’s potent blow. The cascading water flowing beneath them is colored with extraordinary depth, making the cover look almost classical. 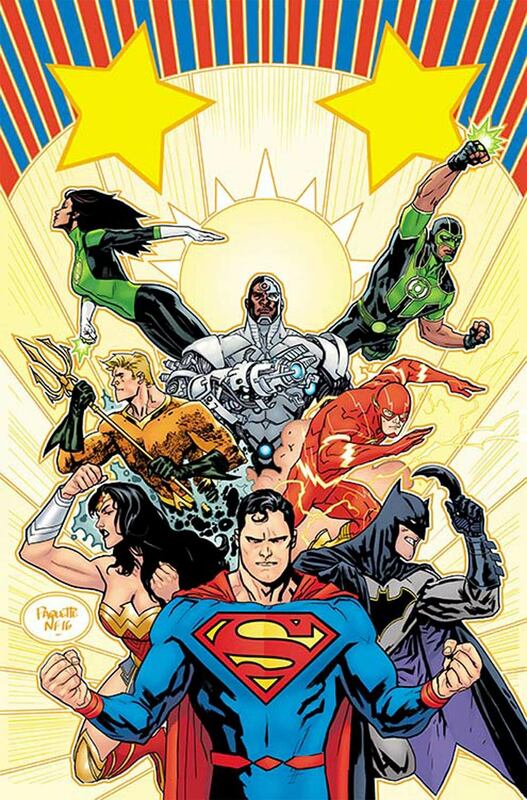 By placing Aquaman at the center of the image, Middleton immediately draws attention to the triumphant hero, whose bold orange costume pulls the reader’s eyes in. With just a simple action pose, Middleton is able to accomplish a nearly perfect artistic feat. Tim Sale is undoubtedly known as one of the most memorable Batman artists of all time. His return to the character has allowed him to create modern masterpieces that are largely unparalleled by his peers. His cover to the third issue of Batman is timeless and uses only shadows to convey the image of the Dark Knight. White backdrops are very rare for the Caped Crusader and by using one here, Sale creates a strikingly unique image. 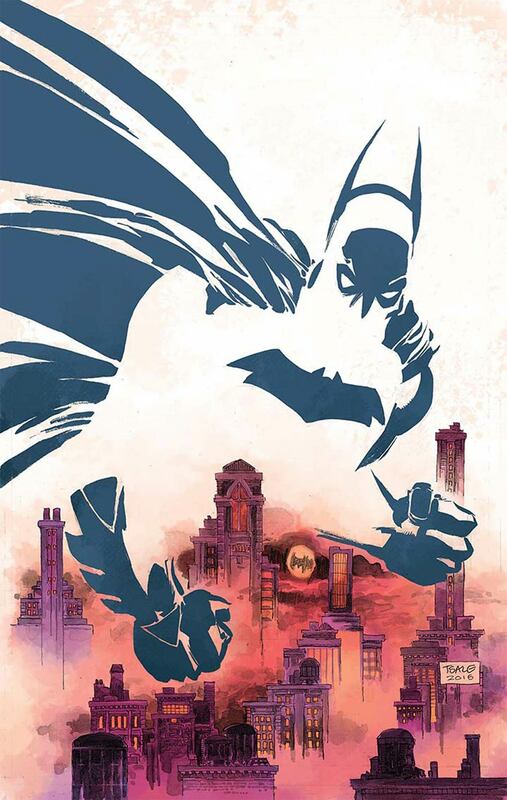 With Gotham looming in the background, carefully painted in a clouded wash of brown and orange, Sale shows the protective nature of Batman and ensures readers that he will be ever-present and ever-vigilant in his war on crime. Bilquis Evely is one of the best hidden talents in comics right now. Her work on DC’s Legends of Tomorrow is astonishing, bringing Sugar and Spike to life in a story that instantly absorbs you. Her cover to Betty and Veronica is yet another smash hit, as it shows two very different women in two very different lights. Betty looks almost heroic as she turns to the horizon, ready to face the waves in her surfer attire. Meanwhile, Veronica panders to the audience, wearing the coolest beachwear of the summer. 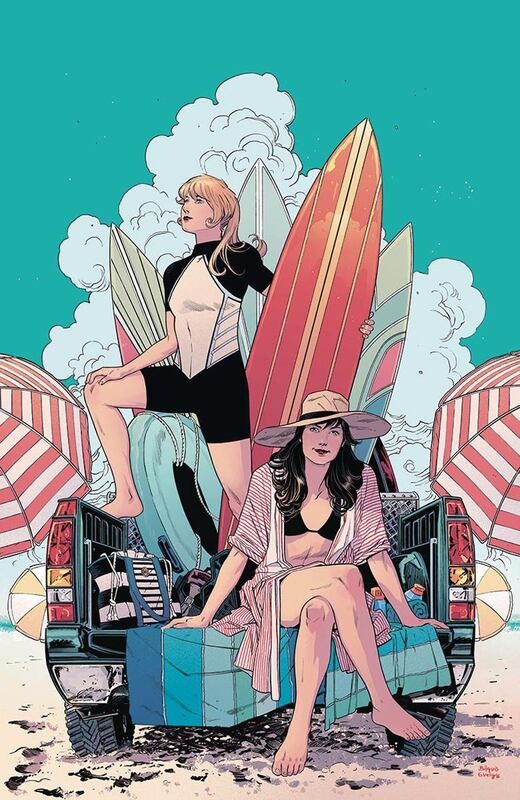 The surfboards and umbrellas frame the image, while the multitude of details in the back of the truck make the cover feel real and lived in. A fantastic launch for Archie’s latest revival! 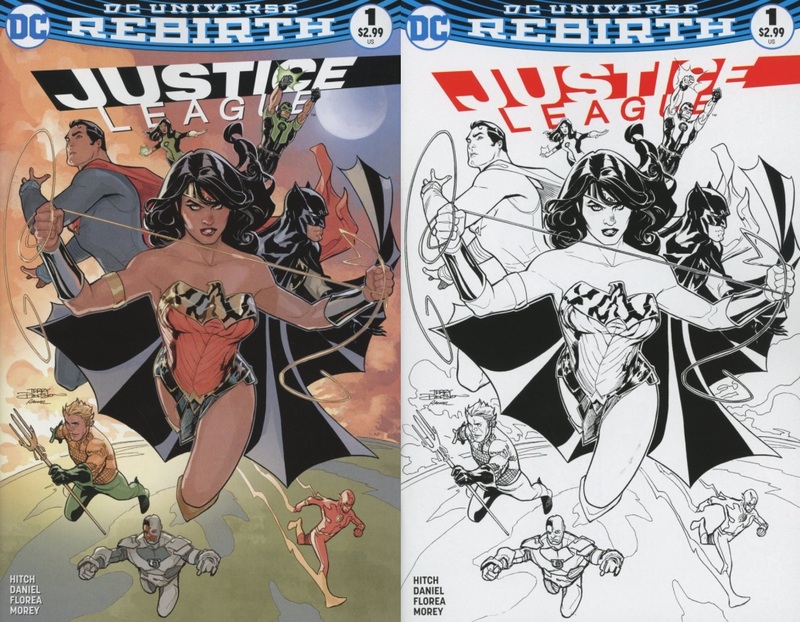 The Justice League have a grand tradition of epic covers showcasing the team at their best, creating iconic imagery that has lasted decades. Yanick Paquette makes a great contribution to this glorious history with his variant cover to the newest series. With a gleaming sun bursting in the background and shining stars overhead, everybody on the team strikes an iconic pose that shows off their powers and their personalities. Paquette deserves additional accolade for the detail on Cyborg’s mechanical limbs and the bursting water coming out beneath the triumphant Aquaman. Superman’s stoic gaze anchors the image and readies the reader for a bold new era of adventure. Tradd Moore is insane. It’s undeniable, he’s certifiable. There is no other way to describe an artist that is so tirelessly dedicated to providing intricate detail to their craft. Those familiar with Moore’s work on Luthor Strode will see that he brings the same distinct linework to his cover to Rumble. He is a natural fit for the fantastical designs that the series is so well known for and this cover showcases the larger-than-life storytelling that readers find within. By widening the shot, Moore highlights the epic and surreal scale of the title, providing an enticing hook to endeavor inside for more. 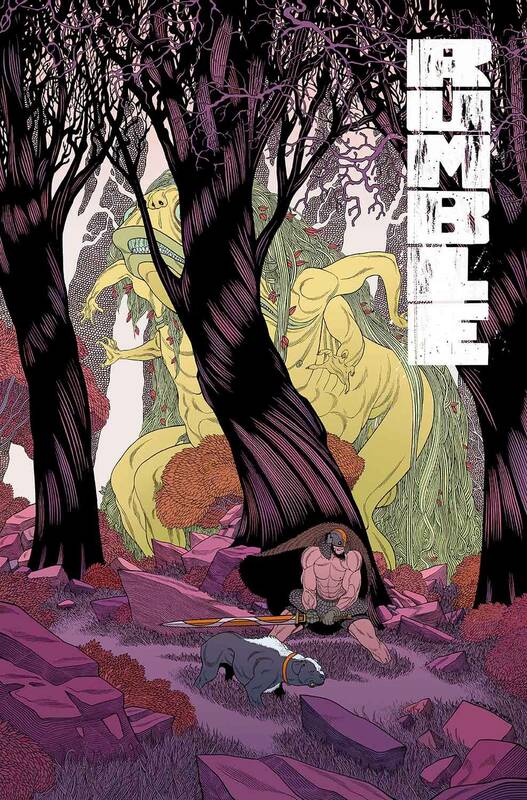 Both charming and haunting, Rumble is in a class of its own. Spotlighted Cover(s) of the Week! When the world needs saving, the Justice League heeds the call and bursts onto the scene! In his exclusive cover for Midtown Comics, Terry Dodson shows the League patrolling the planet, looking for any lurking danger before it strikes. Rachel Dodson’s colors flow across the page, painting the sky in a twilight hue as it fades into a night sky. Superman and Batman contrast each other as Big Blue looks up with wonder and Gotham’s last hope glares down with harsh judgment. It is the determined face of Wonder Woman that dominates the page, as she rushes towards the reader with her lasso firmly in hand. The subtle cross-hatching on her skirt provides a leathery texture and makes her feel vivid and real. It’s an amazing representation of the character as DC celebrates her 75th Anniversary! With righteousness on their side, the Justice League are here to save the day in dazzling color or a very cool black and white edition!